Pegasus Solar's Comp Mount diverts water away from the roof penetration, providing lasting waterproof protection. Together, we’re enabling solar at lower costs and with the highest-quality, longest lasting components. Pegasus Solar, a leading designer and manufacturer of innovative rooftop mounting systems for solar installations, announced today that Sunnova Energy Corporation, one of the leading U.S. residential solar and battery storage service providers, has added Pegasus’ complete product line to Sunnova’s exclusive Approved Vendor List (AVL). 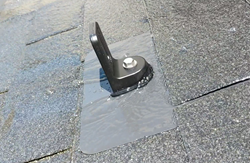 Pegasus Solar’s Comp and Tile Replace mounts have superior waterproof designs, are easy and rapid to install, low cost, and covered by a 25-year warranty. Pegasus Solar designs and manufactures innovative rooftop mounting systems for solar installations. The company’s complete line of rail-less and rail mounts for both composite and tile roofs help enable faster, higher quality, and lower cost solar installations. To learn more about Pegasus’ complete line of patented products, visit http://www.pegasussolar.com, follow @pegasussolar on Instagram, and connect with us on LinkedIn.